Every so often, I’ll informally teach a class of gifted elementary-school students. I greatly enjoy interacting with them, and I especially enjoy the questions they pose. Often these children pose questions that no one else will think about, and answering these questions requires a surprisingly depth of mathematical knowledge. If the pattern goes on, and if , what is ? a number with approximately digits. How can we express this number in scientific notation? 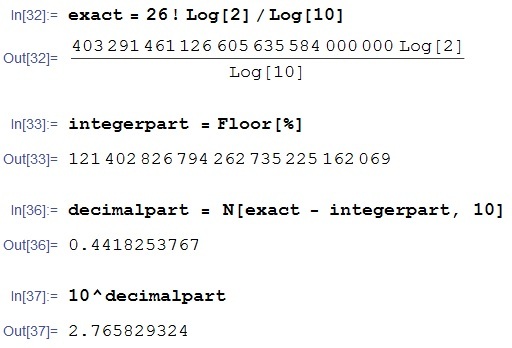 We need to actually compute the integer and decimal parts of , and most calculators are not capable of making this computation. Dividing, all of this paper would cover the entire world with a layer of paper about inches thick, or about 35 sheets deep. In other words, the whole planet would look something like the top of my desk. about 50.4 trillion terabytes of memory. Suppose that this information is stored on 3-terabyte external hard drives, so that about trillion of them are required. The factory specs say that each hard drive measures . So the total volume of the hard drives would be , or . By way of comparison, the most voluminous building in the world, the Boeing Everett Factory (used for making airplanes), has a volume of only . So it would take about 1136 of these buildings to hold all of the necessary hard drives. The cost of all of these hard drives, at $100 each, would be about $1.680 quadrillion. So it’d be considerably cheaper to print this out on paper, which would be about one-seventh the price at $242 trillion. Of course, a lot of this storage space would be quite repetitive since , in binary, would be a one followed by zeroes.